Maynard Dixon arrived in New Mexico with Charles Lummis for the first time in September of 1900. He stayed for two and a half months documenting everything he saw and experienced. Indian life at Isleta, a pueblo just south of Albuquerque. 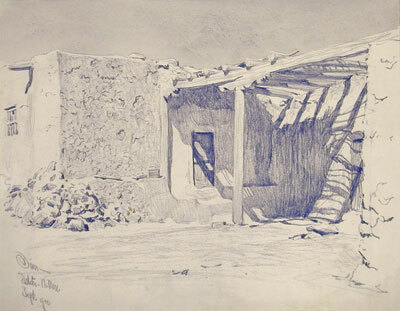 Dixon did travel as far north as Santa Fe where he documented local architecture of adobe buildings. 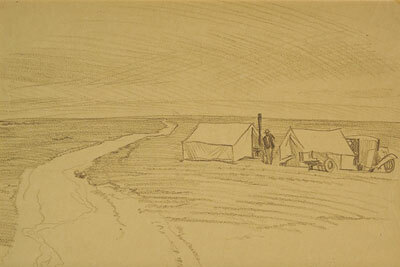 Pencil sketches were Dixon’s way of capturing the moment and essence of place. 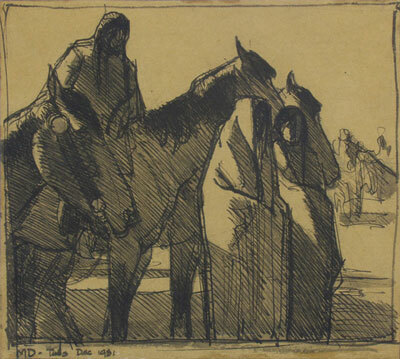 Many of these exceptional pieces would remain in the Dixon family long after Maynard’s death; cherished memories of his first trip to the southwest. Dixon would subsequently make many trips to the southwest over the next thirty years, primarily to Arizona. He wouldn’t return to New Mexico until the summer of 1931. Working as a well paid illustrator in New York City in 1912, Dixon became friends with many important artists including E.L. Blumenschein. Ernest Blumenschein invited Dixon to be part of a new group of artists in Taos; these artists ultimately became the Taos Society. Dixon was not much for organized groups having lasted only three months with his first major art group in 1893 the California School of Design in San Francisco where he received his only formal art training. One group Dixon was a member of for many years was the Bohemian Club. He quit in 1930 when he felt the Club had become too conservative by rejecting a “modernist” piece submitted by the artist Lucien Labaudt. Dixon generally found organized groups too confining in their rules; Dixon’s fierce spirit of independence and his enjoyment of being alone in remote environments suited his temperament far better than belonging to a specific organization. Maynard and his wife Dorothea Lange, a photographer, had been struggling, as all artists were, during the great depression. The stock market crash of October 24, 1929 affected Dixon greatly. He had been scheduled to do a second mural for the Biltmore Hotel in Phoenix, but the commission was cancelled after the economic collapse on Wall Street. The next five years would be devastating for sales. Dixon’s personal painting log from this period showed he executed 282 paintings, and many more sketches that weren’t entered in Dixon’s log, but only sold less than two dozen during the depression years. New Mexico offered Maynard a new environment. He had last visited New Mexico with his mentor Charles Lummis when he was just twenty five, a trip he still remembered fondly. It was an opportunity to visit old friends like Mary Austin, a well known author, whom he hoped would hire him to illustrate her latest book. 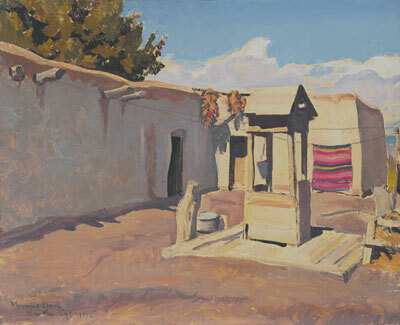 The thought of leaving the bustle of the big city with its expensive lifestyle, and live in a little adobe house with a dirt floor surrounded by the Taos Pueblo in a studio provided by one of the leading art patrons, Mabel Lujan Dodge, was undoubtly exciting to Dixon. New Mexico offered dramatic landscape, unique inhabitants, a lower cost of daily living and the possibility of rejuvenating his now struggling marriage of eleven years. Dixon’s mental and artistic clarity were never sharper when it came to the paintings he executed from his New Mexico period of 1931. Dixon and Dorothea left San Francisco in June in a newly purchased used Model T and headed to pick up their two young boys, John and Daniel in Santa Cruz California. During the trip from San Francisco an unfortunate rollover left Dixon with a broken jaw, sprained wrist and a real longing for early days when he traveled to remote painting locations by horseback. The rest of the trip was uneventful and he and Dorothea arrived in Taos on July 10th. This would turn out to be Maynard’s longest painting journey outside of California, staying in New Mexico for nearly 7 months. 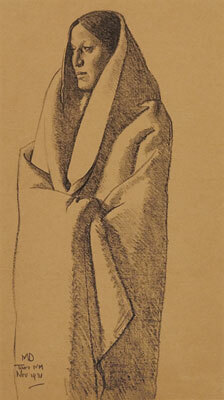 Maynard Dixon, his wife Dorothea Lange, and his two children stayed in a small adobe house. His daughter Constance from his previous marriage, now 21, arrived shortly afterwards. Constance spent the summer with the family and supported herself in part by typing Mabel Lujan Dodge’s autobiography. Having all three children, less financial pressure, and Dorothea around him added to his productivity. The fourth painting listed on Maynard Dixon’s painting log after he arrived in New Mexico was #410 Old Patio. This was very likely the house that Dixon lived in while painting those magical seven months in Northern New Mexico. A photograph of the house taken by Dorothea Lange shows a little adobe casita; both must have felt it was important to capture the place they now called home. 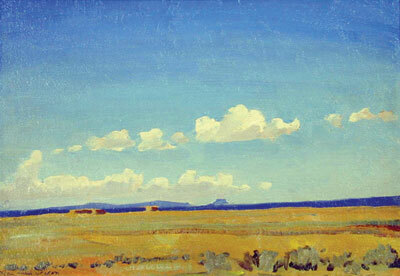 With this painting Dixon not only captured his residence but also the essence of New Mexico. The title itself Old Patio reminds us of an unchanging place and time. Adobe construction, an age old building material, a Rio Grande blanket of red and indigo blue hanging on the clothes line to dry. Rio Grande blankets were made of durable homespun wool and woven by the local Hispanic weavers of northern New Mexico. 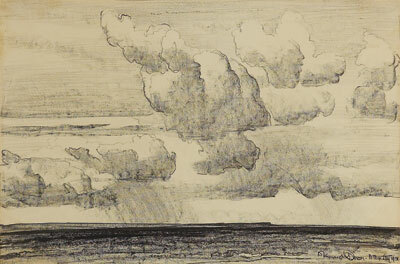 The final and perhaps most Dixon like touch to the painting, were the wispy remnants of monsoonal rain clouds that formed in the late summer New Mexico skies. Old Patio represents all Dixon needed while in New Mexico, a place of shelter, a blanket for warmth, clean water from the well for drinking, and chilies drying on the corner of the roof. In 1931, the elements of a safe place to live, food, water and an a stimulating natural environment full of light, interesting architecture, and compelling local residence must have seemed a saving grace to an artist with little hope for selling any paintings in the foreseeable future and a nation that seemed on the brink of destruction. 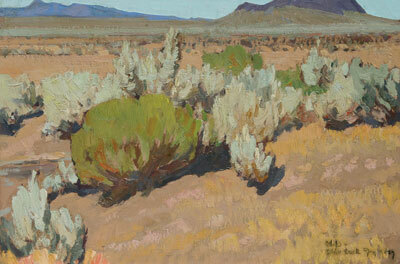 Dixon took full advantage of his surroundings, painting nearly sixty canvases during his 184 day New Mexico trip. 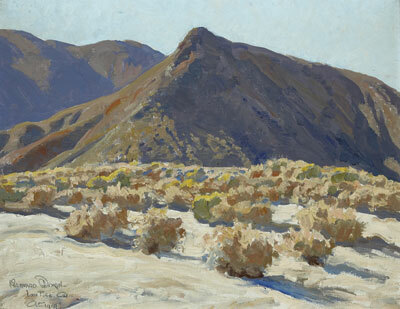 Some of these canvases have become recognized as Dixon’s most seminal works, eight of which are in major art museums: including Earth Knower, Oakland Art Museum, Men of Red Earth, Los Angeles Unified School District collection now on permanent loan to the Autry National Center, Watchers from the Housetops, Phoenix Art Museum, and Round Dance, Brigham Young University to name a few. Dixon was able to “out” some very impressive paintings during this time including Picacho Solito a solitary pedernal in Rio Arriba County, Northern New Mexico. Picacho Solito is an exceptional example of Dixon’s New Mexico high desert landscape. Very simple in composition yet complex in portrayal of fall grasses: yellows, reds, greens, with a nearly obscured dry arroyo subtly meandering through a field of late summer grass. 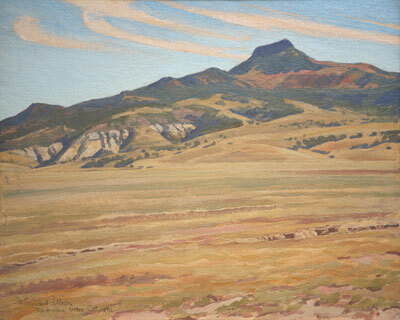 This remote section of New Mexico would capture other artist’s attention including Georgia O’Keeffe who would make her home in Abiquiu, Rio Arriba County not far from the location Dixon executed Pichaco Solito. Many things don’t seem to change in northern New Mexico. Today Rio Arriba County has only 41,000 people, many still living in small adobe homes making a living from the earth. The same unchanged mountains, blue skies, cold nights and warm days abound. Roasting Chile peppers, burning Pinon and pungent Chamisa blooming in the fall are still fragrant in the thin New Mexico air just as they were in 1931. Dixon was a man who lived with his senses, his eyes to soak in the light and his nimble thin fingers to replicate the images etched in his mind. 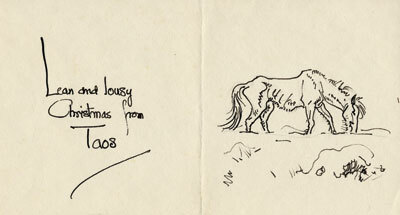 His memories are now our memories forever captured on paper and canvas in the summer, fall, and early winter of 1931. Unfortunately for all of us who would have loved to see more of Dixon’s interpretation of New Mexico, we are only left with two trips. Dixon’s marriage would only last another three years and the country’s Depression continued to deepen, making trips to New Mexico impossible. Dixon’s trip leaving Taos and heading back home to San Francisco saw an exodus of families leaving Oklahoma, Arkansas, Missouri, and Colorado. Years of poor agriculture and seven years of drought led to the Dust Bowl and the migration of the “Okies.” Dixon first uses the term “Forgotten Men,” referring to the many disenfranchised souls he saw heading to California. Dixon never made it back to the Land of Enchantment, but his longing to return the following summer is something many of us can surely appreciate. Desert Dreams: The Art and Life of Maynard Dixon, Donald J. Hagerty, Gibbs Smith Publisher, Salt Lake City, Copyright Donald J. Hagerty and John Dixon 1998. This article was excerpted from Canyon Road Arts: The Complete Visitors Guide to Arts, Dining and Santa Fe Lifestyle, Vol 3, 2007-2008, pages 42-48. Canyon Road Arts is published by Medicine Man Gallery. All rights reserved.